Zendesk employs tickets, or records of all the interactions related to a specific customer and a specific problem, to manage the quality of customer experience. A ticket can be initiated by a phone call, a tweet or Facebook update, by email or face to face. However a client chooses to ask for help, whether for further training or resolution of a problem, the result is a ticket. When a it first appears, a ticket is New. After an agent accesses it, it becomes Open. If it needs a response from the customer or someone else like a regulator, it becomes Pending, and then Open again when it comes back. When the issue is resolved, the ticket is designated Solved. It then ages for a designated period to allow the client to follow up if necessary before being closed. Zendesk allows clients to track all customer interactions in a single consolidated environment. Whether a customer contact occurs through email or chat, through a mobile app or social media, it is visible from within Zendesk. Not only can any email become a support ticket with a single click, but tweets can also be converted from a public interchange on twitter into a ticket enabling private interaction with the customer. Clients can allow their customers to chat on line with a representative, search a knowledge base or interact with one another on community forums. Zendesk implements message board functions that allow users to set up forums as part of their support effort. Community support operations can be peer to peer forums in which users share their own experiences, or they can be managed by moderators employed by the company. Variations on the same functionality allow the construction of a knowledge base which the company’s clients can access on a self-service basis. If the need arises a forum topic can be promoted to ticket status. Customization of a customer service portal allows an organization to brand it so that the portal looks just like the rest of the operation’s web presence. Control of Zendesk pages through Cascading Style Sheets allows customers to tailor their colors, fonts, menus and layouts. Logos can be added and any language employed within the portal. Zendesk’s standard offering allows the use of HTML templates and the specification of customized email addresses and domain names, and the Enterprise addition can handle multiple branding of a single centralized help desk. Integration with other applications is a Zendesk specialty. Almost any device or software a company uses can be configured to work with Zendesk to complement help desk operations. * Android/iPhone integration unchains help desk personnel from the office, permitting them to handle tickets on the go. * Basecamp project management software can access new feature requests submitted through a Zendesk operation for evaluation and possible inclusion in new versions of software. * Beanstalk revision control software can be integrated with Zendesk to allow tickets to be linked with the software changes that resolved the situation. * Campfire chat rooms are a natural adjunct of Zendesk. They allow customers to enter a chat room and interact with customer service personnel. * Twitter integration allows Zendesk users to turn tweets from customers with problems into customer service tickets, called Twickets, and address them through the Zendesk system. * Facebook users can sign into the social network with Zendesk’s single sign in capability to monitor their company’s page and address customer service issues that may be voiced there. * FreshBooks lets users of Zendesk track the time they dedicate to customer services and, if necessary, produce invoices based on those figures. * MailChimp mailing list software can be configured to provide help desk customers with informative newsletters. * OpenID can be set up to allow users to log into Zendesk with its identity verification. * WordPress integration allows a company to make its blog an actual part of its customer service effort. A blog question can be assigned a support ticket directly from WordPress. * CRM (Customer Relationship Management) and Help-desk support goes hand-in-hand. For any organization both the applications are backbone of their customer experience enrichment. And Zendesk has done fantastic job of integrating with two of the best CRM solutions – Highrise and Salesforce. 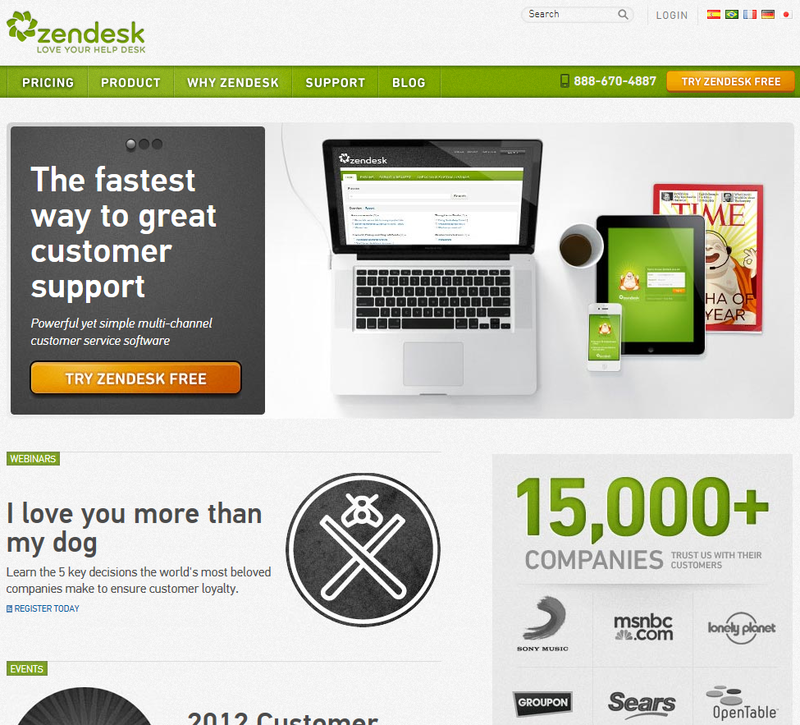 Zendesk is a great help desk offering for businesses of any size ranging from single person to enterprise. Around the globe 10,000+ businesses are using Zendesk to support customers and resolve issues quickly. You can try it for free and if you like it, you can buy any of the plans offered from $9 Per agent/month to $99 Per agent/month pricing. Better support ticket management, multi channel support, forums, custom branding and awesome integrations with other applications put Zendesk forefront competitors in help-desk solutions. For more details about help desk support tools and online ticketing systems, visit www.web-based-soft.com. Zendesk sis indeed an easy, effective and useful tool for customer support reps around the world. If you’re looking to hire outsourced customer support reps to handle your customer support, I recommend our site: Staff.com where you can hire a full time customer support rep. I love Zendesk and have used it for customer support. Its an easy yet very powerful tool. I started my career as a freelancer from Staff.com and landed a job as a customer support rep and good thing Zendesk was easy to learn with and the best thing about it is that I can access my support tickets wherever I go through my iphone. Your tool looks very good and what I like that it is cloud based technology and that it offers lots of apps and forums and blogs to be created. I have been using Comindware task management system which is great as well and which is free of charge.